Some more dodgy videos – but not in that sense. I found a new method of making these which involved chucking all the video footage into a food mixer, whizzing it around for a minute or so, and seeing what popped out. I added a few bits of parsley for decoration. I’m quite pleased with the results. I hope you like them too. These short videos cover our week in Morocco at the end of December, bagging a few 4,000m peaks in the High Atlas. If you want to watch them all in sequence, there is a YouTube playlist. It’s only 16 minutes long, so there’s no excuse for not watching, and you can even combine it with your morning evacuation for those of you who like to take your time over these things. Don’t forget to read my trip report too, if you’ve not already done so. There are also lots of still photographs in my Flickr album. This first video on the sequence features the the standard trek up the valley from the village of Imlil to Toubkal Refuge, in the heart of the High Atlas, and an ascent of Jebel Toubkal (4,167m), the highest mountain in Morocco. There is always snow in this part of the Atlas in winter, but on this occasion, it was mostly just a modest dusting, and we completed most of the ascent without crampons. There was a curious lenticular cloud on the summit of Toubkal, which produced severe winds. It was absolutely freezing up there, with frost glazing all the summit rocks, but once you got out of the wind in the shelter of rocks, it was actually quite warm. 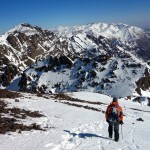 We took an alternate descent route down from Toubkal via its north-west couloir. We tried to climb another 4,000m peak, Imouzzer (4,007m). 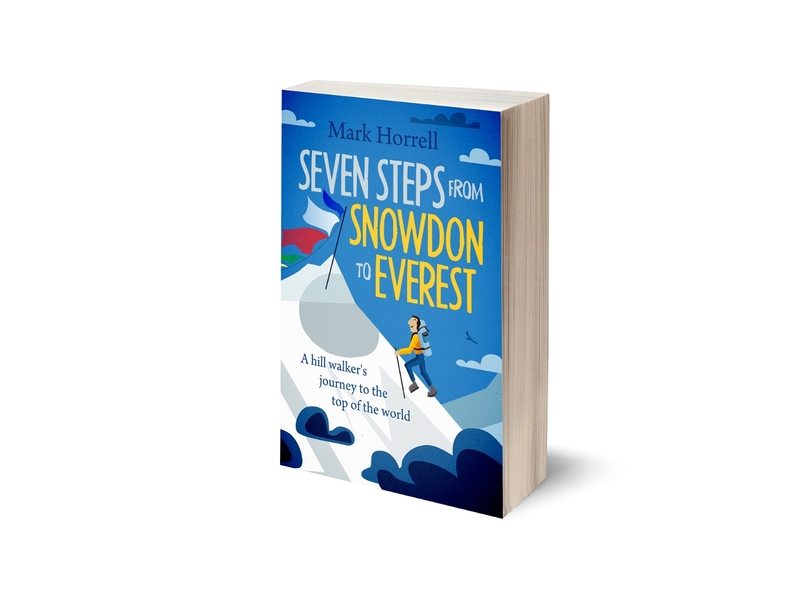 I’m told this is something of a snow plod in winter, with several metres of snow filling a deep cleft between the fore-summit and main summit. Alas, without snow bridging this cleft, the ascent is actually a technical rock climb for the last five metres, which we weren’t equipped for. Never mind. We had fun trying. 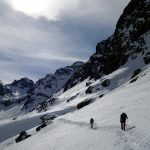 On our second day at Toubkal Refuge, we walked up the far southern end of the valley and climbed Ouanoukrim, Morocco’s second highest mountain. It’s a straighforward ascent with some easy scrambling up its east ridge. Once again we found the mountain mostly bare of snow. Ouanoukrim is a twin-peaked mountain. It’s higher summit, Timesguida n-Ouanoukrim (4,089m) is a rocky plateau which rises at the southern side of the High Atlas, and looks across the Anti-Atlas and Jebel Sahro ranges to the sands of the Sahara Desert. 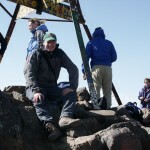 It’s second summit, Ras n-Ouanoukrim (4,083m) is a more compact summit with fine views across the valley to Toubkal. This lesser-known peak, 4,030m Akioud, was actually our favourite climb of our little trip. Our guide Lahcen was feeling ill, so after breaking trail some of the way through snow, he gave us directions and left us to get on with it. We ascended a snow gully to a pass, but the top part of the ascent was mainly on loose rock. 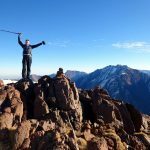 Akioud has a tiny summit, but has a central location wedged between three of Morocco’s other 4,000m peaks, Ouanoukrim, Toubkal and Afella. It’s quite a privilege to stand there and survey the scene. Edita did some of the filming for this video, so you get to see my ugly mug for a few seconds, which is a dubious bonus. On our final day we returned to Imlil, but went via another peak, 3,650m Aguelzim, which turned out to be more of a plateau at the northern end of a ridge. Like Ouanoukrim, Aguelzim rises on the very edge of the High Atlas, but looking north rather than south. The northern view is less dramatic, but interesting nonetheless. From Ouanoukrim the view was of lesser mountains (the Anti-Atlas and Jebel Sahro) as far as the eye could see. From Aguelzim the view is a large flat plain which includes the city of Marrakesh, a couple of hours’ drive from Imlil.